Good Stuff NW: Blackcurrants For "Cassis de Gaston"
Blackcurrant season jumps out at me when I least expect it. This year it was mid-June when I asked Anthony and Carol Boutard of Ayers Creek Farm in Gaston to reserve a flat of their amazing organic blackcurrants for me. A couple of years ago I wanted to make some black currant liqueur, hoping it might turn out half as seductive as that made by their farm chef and my friend, Linda Colwell, who had served me some of the luscious liquid she had infused using those selfsame currants. 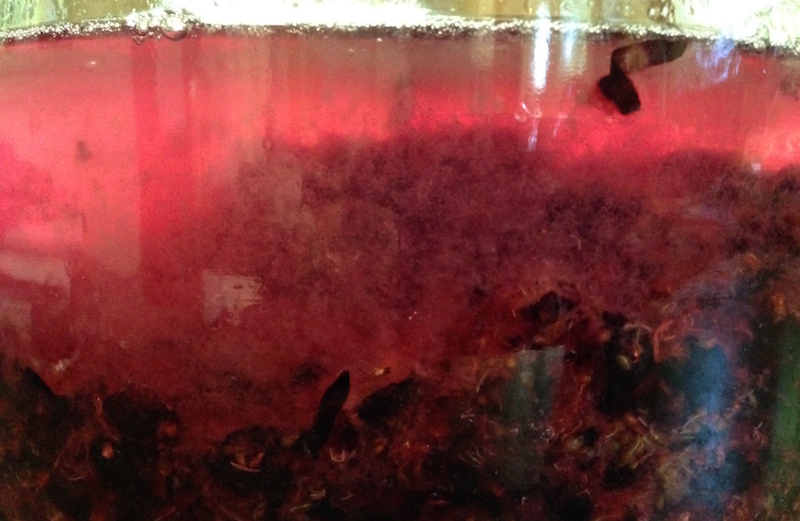 It being the first time I'd experimented with the stuff, I infused two pints of crushed currants into a bottle of vodka, let it sit in our basement for a month, filtered out the solids, then added sugar to taste. After a few more months (I really forget how many) of hanging out in our basement, I tasted it and, as my husband would say, holy cow-ledo! Smooth, port-like, the color of dark red velvet and tasting deeply of currants, this was nothing like the bottles of commercial Creme de Cassis I'd bought from the store. 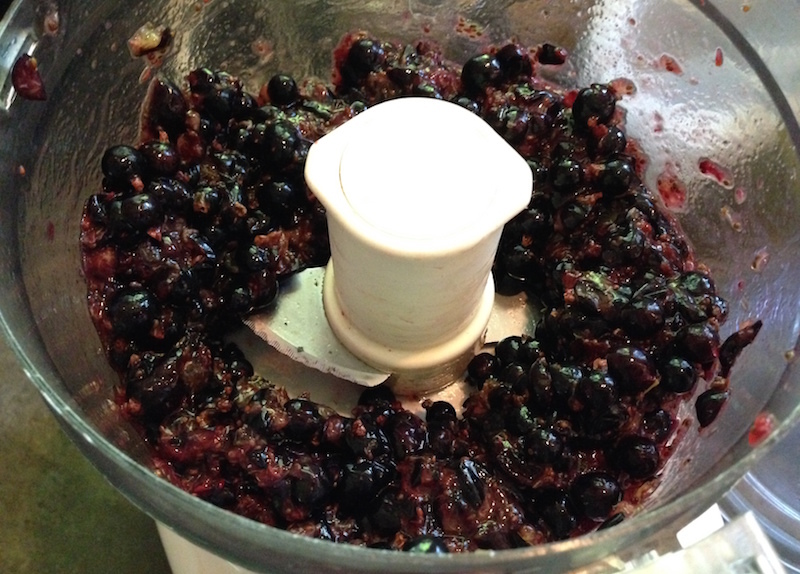 I got the call from Gaston that they were picking their blackcurrants this week, so if you want to make some liqueur this summer you need to head to your farmers' market or a produce purveyor that carries local produce. If liqueur isn't your jam you can make preserves, but you'll need to move quickly since this fleeting summer fruit is not going to wait. Blackcurrant Liqueur, or "Cassis de Gaston"
As mentioned above, the first year I bought two pints of currants and infused one bottle of vodka with them. This year I'm using eight pints and infusing three liters of vodka, equal to four single bottles. In a month I'll let you know how it turns out! Clean currants and pull off any large stems. 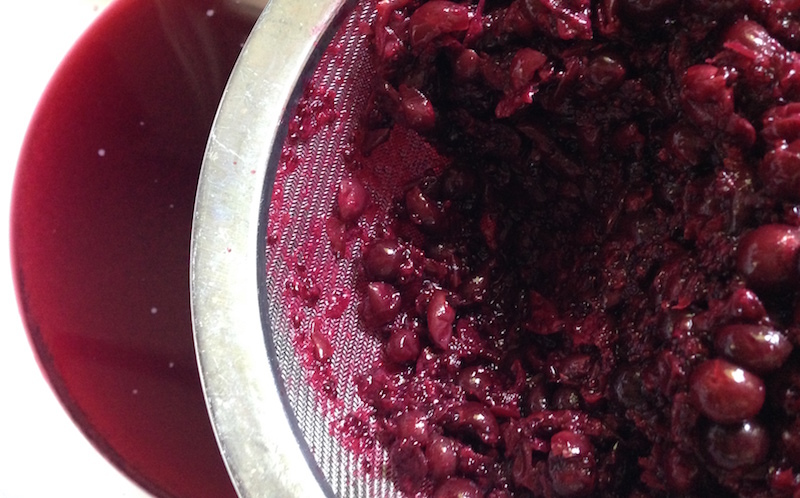 Working in batches, place the currants in a food processor and pulse five or six times until they are chopped but not puréed. Put the chopped currants into a clean glass container and add the vodka, stirring to combine. Cover and put in a cool, dark place (I put it in the basement) for one month. After a month, filter the mixture through a sieve, pressing out as much liquid as possible, then dispose of the solids in your compost. A general rule of thumb is to add sugar in an amount that is 20% of the weight (not the volume) of the liquid, but you can adjust to your taste. Put it back in the (washed) glass container for a few additional months to allow the flavors to combine and the vodka to mellow. Taste occasionally until it suits you. This is wonderful by itself as an after-dinner drink or when drizzled on ice cream. It can also be combined with a dry white wine (2 Tbsp. of cassis to 6 oz. of chilled white wine) to make the drink called Kir, or use the same proportions to make a Kir Royale, substituting champagne for the white wine.